CubeSensors has had an amazing 4 years. Unfortunately all good things come to an end. We’ve created an original and innovative solution to monitor ambient environment and quantify it. The original device was announced at the Launch Festival in 2013, where we won Best Hardware award and launched at TechCrunch Disrupt Hardware Battlefield 2014, where we also won. We have customers in over 50 countries around the world and have processed billions of data points. In the years where many crowdfunded devices failed to ship, we were able to design, manufacture and ship our devices on a bootstrap budget. All in all CubeSensors run on about 700k USD of investment for about 3 years. However even with high demand, successful product and proof of traction, we were not able to secure enough financing to increase our working capital to a meaningful level. That meant that we were forced to do minimal batch runs financed by prepayments, which in the worst case meant a waiting queue that was about 5 months long. We started when online services for IoT devices were not mature enough. So we had to build a whole stack needed to run a large number of distributed devices. We’ve felt that it’s important to have complete control over experience and reliability of the service. We’re proud of our achievement since we’re one of the few teams of the world that went through the whole process while building all the necessary tools along the way. CubeSensors team size never exceeded 8, while taking care of industrial design, engineering, manufacturing, software, distribution, ops and everything else. We’ve even build the next generation of the product, Koto. However we were never able to build a batch for the initial run, due to lack of working capital. That’s why we’ve decided to close CubeSensors. We’re not going sell any new devices. The assets of the service were sold to a new and exciting product called Klevio (klevio.com). It’s a new project where some of the CubeSensors team members will also contribute to in the future. There is one more thing that we feel it’s important. Far to many times we see successful startup products wind down for commercial reasons. While we understand the business logic behind it, we want to make a different precedent for all other startups that hit a commercial roadblock while still having loyal community of supporters. We don’t want to let our customers down. We’ve made sure that existing CubeSensors will run for a foreseeable future, keeping the service and support live. That will enable our devices to keep bringing data and insights to our users. It was an emotional and exciting journey. Now it ends so a new one can begin. The campaign for Koto smart sensors was off to a strong start, but as we near its end, it’s become apparent that it wouldn’t end as well as it would be necessary to bring all Koto sensors into your homes in the planned timeline. We don’t want to receive any contributions without being 100% sure that we can deliver everything on time, which is why we decided it’s best to cancel the campaign now and issue full refunds to all backers. What’s next for Koto? We’ve got great feedback about what you like the most about Koto during the campaign. 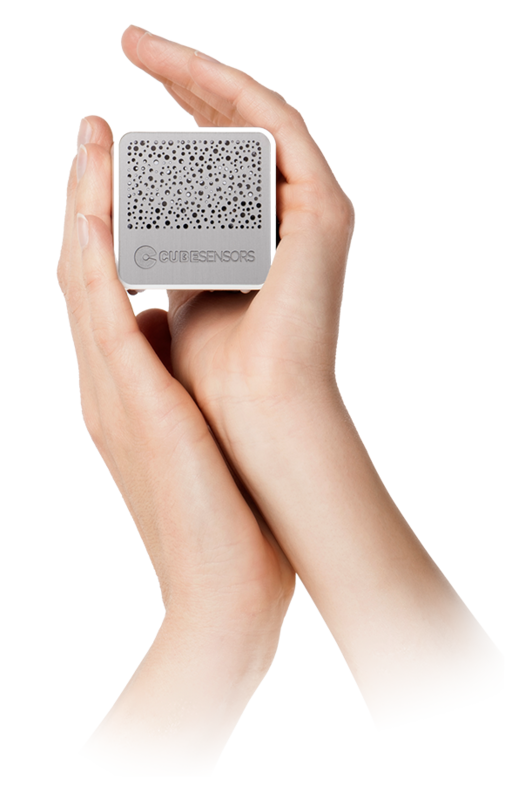 This is why we’ll be focusing our efforts on the production of the most popular sensor first: the air quality monitoring Koto Air. You can already pre-order your Koto Air on our website. What’s different now is that you’ll only be charged when your Koto Air is ready to ship and you can easily cancel your pre-order at any time. IFTTT and other software updates that will be compatible with existing CubeSensors are also coming out soon, and other Kotos will be released at a later time. Koto smart sensors for a healthier home are now live on Indiegogo! Koto, the evolution of CubeSensors, is now live on Indiegogo! This time we’re introducing three new smart home sensors with some exciting new features: a display for notifications, the ability to detect dust, cigarette smoke, lightning strikes and more. Koto Blink, the entry level sensor, helps make any room more comfortable by monitoring temperature, humidity, light and noise. It only needs to be recharged twice a year and can store data offline for weeks, which makes it ideal for rental apartments, vacation homes, and a great travel companion. Koto Air is an upgrade to Koto Blink, which can detect dust and harmful gases in the air you breathe. The ability to monitor air quality and pollution makes Koto Air perfect for bedrooms and nurseries, especially in homes with children, the elderly and asthmatics. 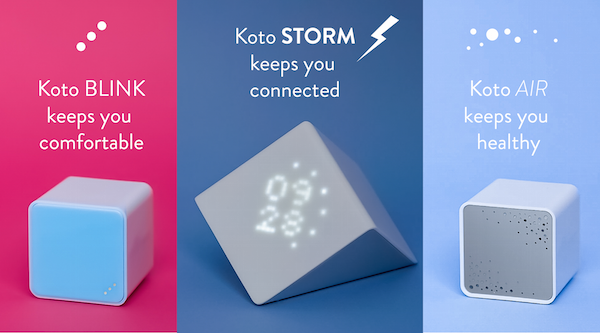 Koto Storm makes sure you’re always just a glance away from home by connecting to your WiFi. It has a minimalistic display that can show the current temperature or let you know when you receive a new email, so it can act as a notification center for your living room or office. Koto Storm is also packed with indoor sensors and can even detect approaching storms, so you can plan your outdoor activities better and protect your home during storm season. For more details about how Koto sensors can help you sleep better, keep your family healthier and more, visit our campaign page now. We still need your help to bring Koto to your homes faster, so please support our campaign and tell all your friends about Koto today. Thanks!